Supervise children at all times. Children under age 7 years must be accompanied by a person age 16 years or older. Get swept up in the enchantment of Disney animation in this 3D concert movie starring many favorite Disney characters. The Pass allows guests to enjoy one-time priority access to selected attractions across the park. It's easier than ever to enjoy all the must-do fun at Hong Kong Disneyland! Disney magic meets Disney music in this charming 10-minute, 3D fantasy-adventure starring Donald Duck. Stroll beneath a regal marquee and make your way to the cottage-like Fantasyland Concert Hall, passing whimsical show posters starring a bevy of classic Disney characters. Upon receiving a pair of “opera glasses,” enter the 492-seat theater, home to a large golden proscenium and red crushed velvet curtain, and take your seat for the show. As the lights dim, Donald Duck is fast asleep. Mickey Mouse appears with music in hand and wakes Donald before rushing offstage to ready the show. As Donald prepares the orchestra for Mickey, he comes across the conductor’s baton and schemes to work a little magic by donning Mickey’s Sorcerer’s hat. But things get out of hand fast and Donald is plunged into a 3D dream world of classic Disney animated musical sequences. 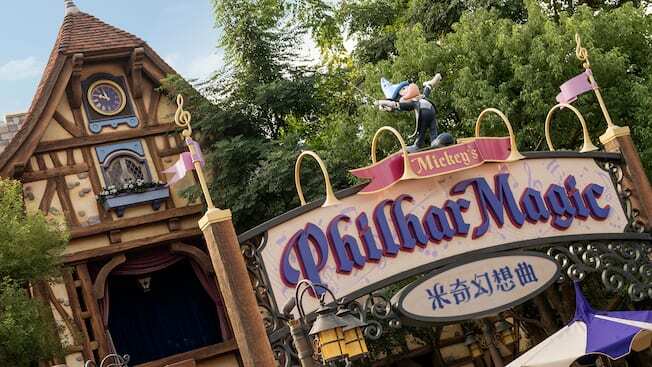 Combining animation, music and special surprises, Mickey’s PhilharMagic is sure to delight and inspire both the young and young-at-heart—and have everyone in your family humming a beloved Disney tune. Immerse yourself in the wonder of Disney storytelling thanks to a 150 foot-wide wraparound screen—and the magic of 3D. As the show begins, the Fantasyland Concert Hall magically disappears and your larger-than-life, almost 180-degree, 3D journey with Donald Duck takes flight. In addition to a seamless screen and spectacular 3D, Mickey's PhilharMagic features child-friendly, in-house special effects throughout the presentation. These effects, created to further immerse you in the adventure, include light splashes of water and other fun surprises.